Here’s a little mini-review from the Casual Restaurant Critic on just one of the many food trucks now sprouting up all over the place; Truck Chef is one of the more popular options. This food truck features burgers for the most part and they are good; worth hunting down a location which you an do my checking their Facebook page, which also features a lot of really enticing photos that will make your mouth water. Besides burgers there are also some healthier options (pork belly tacos are not only delicious, they are healthy. Aren’t they???) 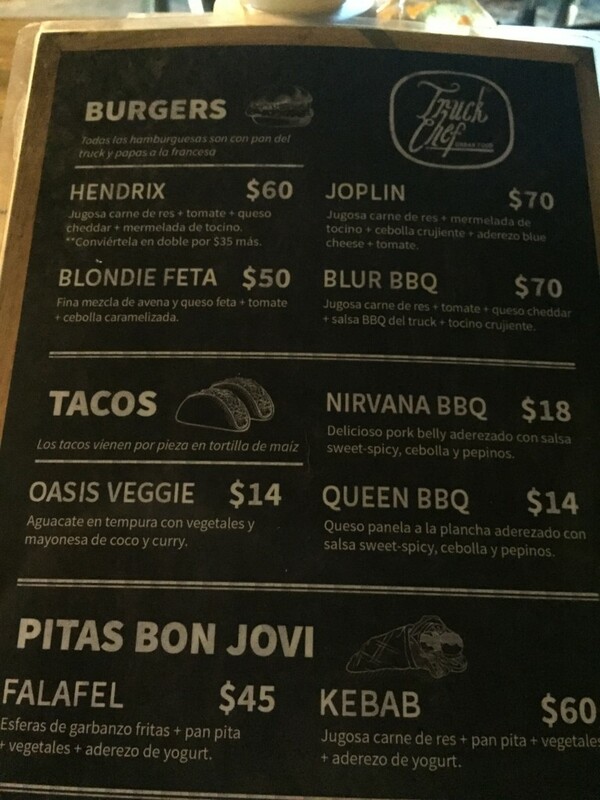 and the whole menu has a rock and roll theme, in case you hadn’t picked up on that. The Casual Hotel Critic doesn’t show up as often on this website as the Casual Restaurant Critic, but occasionally he pops in and offers observations on a hotel or two, which might or might not help you with your travel planning. This time, the Casual Hotel Critic and his lovely Better Half – yes, like the Casual Restaurant Critic – this one also has a Better Half – visited the number three hotel in Cancun on TripAdvisor, as numbers one and two were already booked due to it being Semana Santa aka Easter break. The hotel, formerly called The Royal, is now the Hyatt Zilara and the overall impression is positive. For the money, this hotel should be perfect. And in many aspects, it is. A positive, no kids. Nothing against the little critters, but the CHC has been there and done that and occasionally he likes to relax in an adult environment, devoid of screaming, crying and whining by the kids, followed by reprimanding, cajoling and wimpy caving in by exhausted parents. It’s all inclusive. Normally the Critic eschews this kind of accommodation, but when all one wants to do is vegetate in the sun and eat and drink at will, not having to fish out a wallet or sign a bill is very welcome indeed. And the Hyatt Zilara offers up quality drinks (would that restaurants in Merida understand how to prepare a decent mojito like the one served here) and tasty, quality food, from its silly little billiard room where people are playing Jenga that offers a delicious chili that would do well in the Merida English Library’s Chili Cookoff competition to the Chefs Plate restaurant (more on that later). Large Asian clientele. You can’t help but notice that you are surrounded by young Asian couples, mostly Japanese and Korean. A waiter informs the CHC that the hotel is a destination for honeymooners from Asia and that all the people one sees are on their honeymoon. This is an advantage because they are not raucous and screaming, although there were some partiers from Quebec at the beach who insisted on screaming their French Canadian jokes across five beach cabañas and would follow up each ‘joke’ with loud nasal cackles not unlike a gaggle of geese discovering a previously unseen dish of corn feed. Hands on hearts. One is taken aback at first but comes to expect it from even the gardener or the painter who is touching up some railings. Each greeting and question is answered with a slight downward nod of the head and a hand placed over the employees heart. In some cases it works, while in others it seems a little forced and still others forget to put their hands on their hearts when they say ‘hola’ as they pass you by. Apparently this is to convey to you, the honored guest, the sincerity of their commitment to you. Again, sometimes believable, other times not so much. A fantastic beach. When you come to Cancun you don’t come to experience the noise of the Kukulkan boulevard with its polluting noisy buses racing side by side cutting off little green and white Tsuru taxis with their fist-banging, head-shaking irate drivers. You come for the beach, which is what Cancun was all about back in the day before the spring breakers came and it went from ‘exclusive destination’ to Daytona Beach with chiles. And the Hyatt Zilara still has that beach. The entire front of the hotel is beach and it is carefully tractored and groomed each morning so that people will not find any nasty seaweed as they make their way, like baby turtles, to the waves crashing out front. It’s mostly too rough to swim, but there are lifeguards and one can wade out a little and getting refreshingly battered by the waves that, once, they have reached the shore, come back with equal strength the other way, challenging you to keep your footing and not get sucked out to sea. A lifeguard watches this and will blast a short whistle if you get anywhere near waist-deep. Spice is the go to buffet standby when everything else is booked, closed or too fancy. It’s not Caesars Palace and the Bacchanal Buffet by any remote, way off-in-the-distance stretch of the imagination, but there is a small variety of items that are of acceptable quality. Asiana has – you guessed it – Asian food and a teppan-yaki ‘show’ that is borderline cheesy but the honeymooners seemed to enjoy it. Sushi is available as an appetizer before the teppan-yaki but this is nothing to send pigeons home about. Mostly rice with a hint of fish, it made the CHC almost cringe in embarrassment for the Asian couples around him and Better Half. What were they thinking? The final product is a lot of food so don’t overdo it on the rice-y sushi. Pelicanos is the casual all-purpose restaurant on the beach, with a great view and great staff. Very attentive, the food is very good and with that view, it’s a winner. Portions are small so you can order lots if you are hungry and try many different items from the short but varied menu. Chef’s Plate is the other high end restaurant that, along with Asiana’s teppan yaki show, one needs reservations for. In either case, the CHC and BH just showed up and waited for no-shows which was the case on both nights, so they got in with no difficulty. Ladies, wear dressy sandals at least for the Chef’s Plate as you won’t get in with flip flops. They are trying to maintain a certain decorum here. This restaurant was the best of the bunch. A long table for about 20 people, and a tasting menu featuring fish, duck, salad, dessert and a few more plates. The menu was explained by a talented Porfirio who spoke English, Spanish and Japanese to his guests and, as each dish was served to the diners, he would then explain what the ingredients were and how it was made, again in three languages. Special shout out to believe it was Jennifer at the front desk who seemed genuinely concerned about everything to do with the CHC and BH’s stay, especially after finding out that the room she had assigned had a ladder in front of it and was obviously being maintained. She later approached BH and offered a spa treatment which was quite nice. It is a very expensive hotel and so, one notices these little details a bit more. Great stay though if you can swing it or find a good promo. I have put this up before, but I am doing it again, in honor of all the plants who will soon die as a result of the brush fires and quemas that accompany us at this time of the year. “El chile pica” warned the waiter, pointing to the blackened chile habanero bits mushed up in the little bowl. The gringo smiled. He had eaten chiles before. Had even watched a show by Rick Bayless once where Rick explained how to spot a particularly spicy one. “De verdad pica; tenga cuidado” repeated the waiter. He seemed truly concerned and hovered for another moment at the red plastic table watching the gringo, who nodded and waved his hand in a dismissive gesture. The waiter turned back to the counter to pick up another order; mondongo para la mesa cuatro, his Mom told him from behind the counter, hands slick with pork fat as she worked the lechon. He was setting down the spicy soup at table four when he heard a loud cough and the scrape of a plastic chair being violently pushed on concrete; the gringo was standing up waving his hands in the air and his mouth opening and closing like a freshly caught pescado. Comical almost, if it wasn’t for the fact that he looked like he was going to die right there. “Pinche gringo, que bruto; se lo dije” he thought to himself. People at the other tables smiled bemusedly at the gringo’s predicament and those nearby held out their drinks or some tortillas, all of which the gringo ignored, not out of rudeness of course but because he simply couldn’t see them, his eyes were watering so bad. Mom was already out from behind the counter, arms around the stumbling gringo and leading him towards the counter where Luisa had some milk in a glass. Mom was also stuffing tortillas in his mouth to soak up the picante. Little by little, his eyes drying and the coughing subsiding, the gringo came back to this world. He opened his eyes to find himself sitting at a stool by the counter with everyone looking at him. He gave a limp wave with one hand. “Bien, estoy bien” he said lifting one hand and looking somewhat chagrined. Everyone smiled and returned to their meals. He walked slowly, almost carefully, to his table and sat down to finish his tacos. The waiter stopped by at the table. “Esta bien? Si pica el chile verdad? Se lo dije no? he asked with a not unkind smile. “Oh, si!” said the gringo and gave a feeble laugh. The waiter patted the gringo’s shoulder and moved back to the counter. Tacos de lechon para la dos. His Mom gave him a wink.